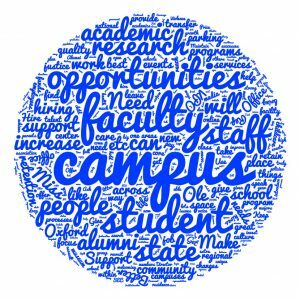 Word cloud highlighting People, Places, & Resources feedback collected during the Town Hall Meeting on Aug. 29, 2016. The people of our university make Ole Miss great. We have exceptional people with a rich diversity of talents and backgrounds. Our alumni and friends are passionate about this special place. Thanks to their passion, we shattered our record for private giving and collected nearly $200 million in 2015 – 2016. On all our campuses, we are building hundreds of millions of dollars of new infrastructure, enhancing our facilities to promote academic goals and help us extend our reach and impact. We continue to be recognized for our work environment and for our welcoming and supportive climate. From our “Great Colleges to Work For” designation by the Chronicle of Higher Education to national recognition for our support of transfer students, it is the strength of our people, this special place, and our resources that enhance our ability to attract the best and brightest to our state and keep them at our university. During the Town Hall, we received 120 ideas about people, places, and resources across the following 8 broad categories. Click on each category to read all the individual ideas submitted by UM community Town Hall participants.